This month, I’m writing a series: the ABC’s of 21st Century Cities. In previous entries, I explored Artificial Intelligence, Backward Futures and Co-creation. Today is disasters. Australia and Brazil are suffering deadly disasters; I hope you recover rapidly and fully. One year ago, Haiti was devastated by a 7.0 earthquake. Over 300,000 people were killed. The core of Port-Au-Prince was virtually leveled. One year later, less than 5% of the rubble has been removed. One million people remain homeless, living in tent cities. The first disaster happened on January 12, 2010. The second one is ongoing. It’s a double crime – unsafe construction and terrible response. Do you have a nagging sense that there’s an uptick in disasters? It’s true. There are four times as many natural disasters as twenty years ago. The trend is still climbing. No one is immune. Fifty poorer countries led by India will suffer the most deaths. A recent report estimates we will see one million deaths a year by 2030 . Industrialized countries will pay more in economic and infrastructure loss, estimated at $157 billion annually. Disasters are reshaping our human geography. 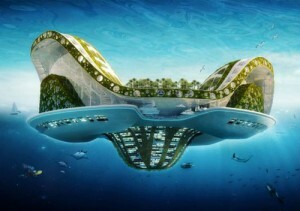 Over one billion people in over 100 countries are at risk of becoming climate refugees; 98% live in developing countries in Asia, Africa, and Middle East (pictured Lilypad2 Refugee Floating Island). The current number of climate refugees is 50 million people, mostly displaced by flooding. 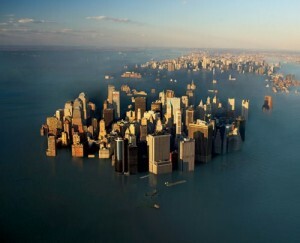 By 2050, the UN estimates as many as 200 million climate refugees. People will migrate to places with food, water, security, education, health, and jobs, away from floods, disease, famine, drought, and conflict. In the US , the predicted hurricane damage on the gulf coast by 2030 is $350 billion , equal to a Hurricane Katrina every 7 years. New York and Miami hold the highest risk for massive infrastructure damage. NBC news reporter Ann Curry’s tweet helped doctors and medicine land at a Haitian airstrip. Is twitter a robust grassroots communication network ready to serve in disasters? Have you been caught a disaster? If so, were you ready? It’s more than just individual procrastination; we even vote to avoid fixing infrastructure. Elected officials get cheered and then re-elected when they respond to a disaster, as they should. But amazingly, when they beef up infrastructure, they lose elections. For every $1 spent in preparation, we save $15 in recovery. Nature or humans? 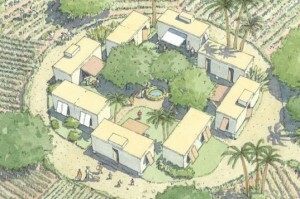 Imagine if Haiti’s construction had been quake-resistant? In New Orleans, Katrina wasn’t the killer, a failed levee was. The two are so deeply intertwined, it’s always both. Mississippi and Alabama, each devastated by Katrina, refuse to enact building codes. Florida suffered 40-50% less damage and fewer deaths. Some recoveries take half a century, like Berlin. Others leap forward, like London. Still others take centuries and even millennia, like Rome. Flooding may steal the great coastal cities from future generations; there may not be future “Romes” to serve as historic markers of today. Can we rebuild better than before? Some cities revitalize and thrive after a catastrophic event. Others collapse, becoming a shadow of their most robust past. Jared Diamond believes collapse occurs when a society fails to adapt to new ecological or economic environments. In other words, to recover, a city has to clearly imagine a revitalized future in a dramatically altered landscape and have the capacity and resources to act. The best time (if there is such a thing) to experience a major disaster is when your country or region is on a growth cycle. The worst is when your city’s in decline already. After nearly total devastation by a 2007 tornado, Greensburg Kansas reversed their decline by imagining a sustainable future and attracting national resources. Will disasters become the reality tv of tomorrow? After a catastrophic flood in 1953, Rotterdam leaders decided to rebuild beyond anyone’s imagination. 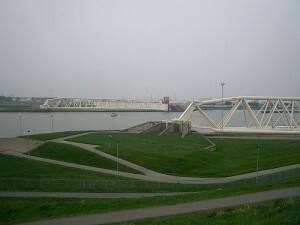 Forty four years later, the Maeslant Barrier opened. It is an engineering marvel, designed to withstand a 10,000 year flood event. Gumption. Building on Boyd’s OODA decision-making loop (Observe, Orient, Decide, Act),Vinay Gupta identifies Drive as the missing link between orientation and deciding to act, in other words, leadership and vision. Wrong-mindedness. The most difficult problem is not inaction but wrong-minded action. Is New York rebuilding a 2050 future or a 1950 rehash? Mindfulness. In contrast, after the 1989 earthquake destroyed the massive Embarcadero highway, San Francisco tore it down and re-established access to the bay from the adjacent neighborhoods. They chose a new, unique future. A future of parity. For New Orleans to build a levee system for a 500 year flood event the estimate is $70 billion. The current repair to the levees is costing $15 billion for a 100 year flood. The entire city’s future remains unstable. 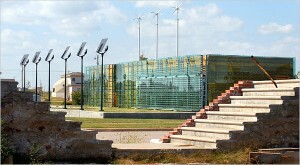 A number of organizations are fully mobilized such as the UN’s Resilient Cities program and Architecture for Humanity. Here’s a few still in the future. Communication networks include our mobile phones. Flying disaster relief robots support a local network. Video games can aid in preparation and emergency response training. Sensor networks provide real time data on locations of people and resources. 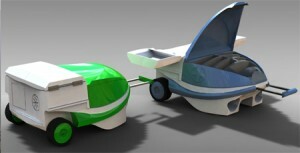 Mobile hospitals will be flown into remote locations, such as solar airships. A medical workstation cart allows doctors to transport supplies and treat victims on site. 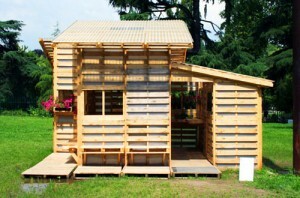 Temporary housing is being designed as prefab or created locally with salvaged materials. 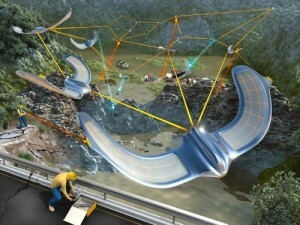 Future housing will be created on-site via 3d printers. Modular solar power enables off the grid energy. Geoengineering attempts to turn back atmospheric change to avoid the most extreme consequences of global warming. Several trends help: localism for food, distributed power especially the use of solar energy, walkable and biking neighborhoods w/ shops and services, DIY initiatives for making things, bartering/trading/sharing networks, communication networks such as twitter and other mobile devices, and so on. A global push for city response plans, strengthening infrastructure, implementing building codes, and building higher and away from oceans is critical. The 9/11 Report described New York as a failure of imagination. Can imagination help us? The strongest efforts come from within a community. Someone steps up; some vision captures hearts and minds. People begin a million small actions towards recovery. If a catastrophic event hits your city, are you ready? Is your neighborhood? Your family? How will you be safe? How resilient is your city? Disasters destroy normal. Many cities and communities find their true mission, and rebuild even better. It can be a moment of deep reflection and learning, committing, and inspiring. The next post, E is for Education. I am failing at my goal to post daily so I will try some new strategies. Thank you for reading, tweeting, commenting! Images: Disaster historic statistics, Haiti tent city, Rotterdam Maeslantkering, Pakistani flood refugees, Lilypad2 floating city, flying disaster relief robots, video games.